Although neither the girls nor the boys swim teams earned enough points to defeat 6A Pope High School at home on Dec. 5, the AquaKnights still achieved 28 personal-best times and four new state-championship qualifying times. Two of the individual state cuts came from junior Erin Hood, who won both the 50 and 100 free events. The other two state times were from girls relay teams. Both the 200 free relay (sophomores Lizzy Kaye and Amalie Little, and juniors Hood and Meghan McMillin) and the 400 free relay (Hood, McMillin, Little and freshman Holland Proctor) came in under the qualifying time. 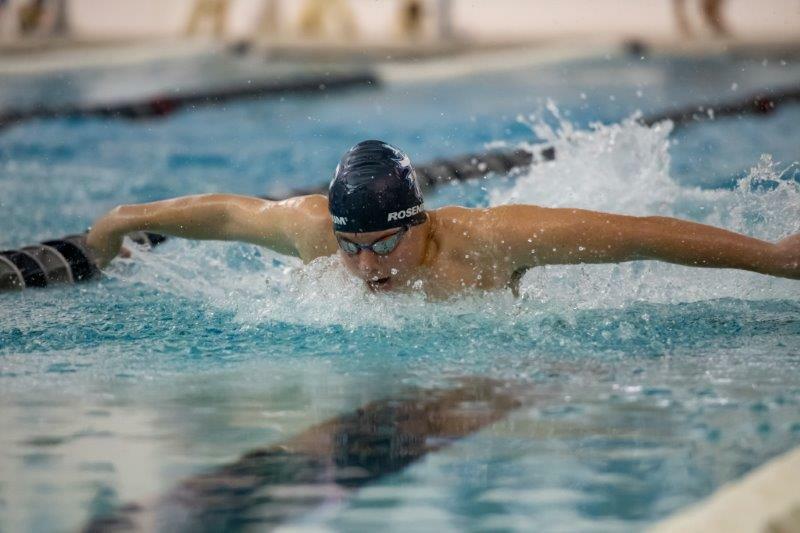 Other top finishes were junior Jason Rosenbloum, who won the boys 100 fly, and Little, who came out on top with first-place finishes in the girls 100 fly and 100 back. Kaye took the top spot in diving for the girls, followed by sophomore Maggie Jenkins in second and freshman Kate Grabowski in third. Junior Will Stratton came in second for the boys in diving, followed by seniors Tase Karamanolis in third and Cooper Selig in fourth. The AquaKnights will be back in action after the new year. 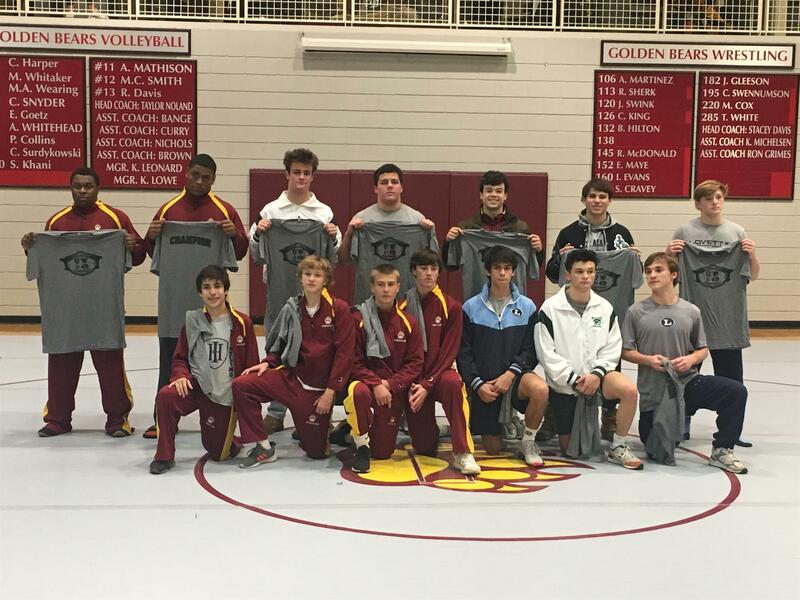 On Friday, Dec. 7, the varsity wrestling team traveled to Holy Innocents' to compete against neighborhood rivals Westminster, Lovett and Holy Innocents' in the first annual "Battle for the Buckhead Belt." The team squared off against Westminster for the first match, understanding that the key to winning would be to keep from getting pinned in the losses and to get pins in the wins. Freshman Thomas Wells wrestled first, while Jack Warren was second. Though both lost, they kept the matches close. Then, senior Charlie Warren pinned his opponent, as did junior Connor Husk, which gave the Knights a 12-7 lead. Junior Grant LeRoux and freshman Nile Bennett were both pinned, allowing Westminster to jump ahead 19-12. Senior Ahsan Hennings and freshman Xavier Agostino answered with two pins, and the Knights retook the lead, 24-19. Freshman Ben Schiffer pinned his opponent at 106 pounds, and freshman Edward Blaha took a forfeit at 113 pounds, which put the Knights ahead 36-19. At 120 pounds, freshman Sam Howe lost a close one 11-8, but by avoiding the pin he guaranteed victory for Pace. Senior Harrison Husk also dropped a close match at 126 pounds. Freshman Jude Black was pinned at 132 pounds, and the Knights forfeited the 138-pound match but prevailed 39-35. The team faced Lovett next, and though the Knights continued to wrestle well, the Lions were the better team. Blaha, C. Warren, Hennings and senior Chilton Tolliver all won their matches against Lovett; Husk received a forfeit. Schiffer, Howe and Husk all battled for six minutes but lost by decision. In the final round, the Knights faced Holy Innocents', the strongest team and the eventual winner of the Belt. C. Warren at 160 pounds and Black at 132 pounds were the only two wrestlers to win against HIES, both pinning their opponents in the first period. Pace lost to HIES 12-68, but overall, it was a very successful evening. C. Warren won the individual title at 160 pounds by going 3-0 at the event. Warren is only seven wins away from the "100 win" club. 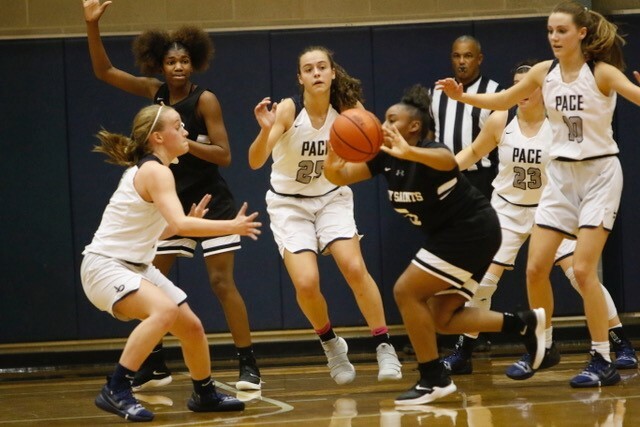 Pace will compete again at home on Tuesday, Dec. 11 (tonight), at 6:30 p.m. against Westlake High School. The varsity girls basketball team moved to 3-0 in region play with a 51-34 win over Cedar Grove on Friday, Dec. 7. The Saints, who always brings a high level of intensity, tested the Pace defense early, scoring 16 points in the first quarter. The front-court duo of junior Virginia Hobbs and senior Kayla Ross collected 29 rebounds, 13 and 16 respectively, in Tuesday night's game against Landmark Christian, and they continued to anchor the Knights' relentless defense Friday night against Cedar Grove. Pace came up big with 19 steals! Senior Joelle Zelony and Hobbs both snagged six steals, while Ross (three), senior Ann Rafeedie (two) and senior Madeline Janki (two) collectively forced the remaining seven turnovers. The Knights shot 50 percent (9-18) from three-point range, led by Rafeedie's six three-pointers. Rafeedie led all scorers with 20 points. Zelony did an excellent job managing the offense and setting the tempo of the game, finding her teammates in transition and making smart decisions down the stretch. Zelony filled the stat sheet with 12 points, five rebounds, five assists and six steals. Pace outscored Cedar Grove 14-7 in the third quarter and never looked back. The seniors—Janki, Fleming, Rafeedie, Ross and Zelony—played patient, smart basketball and held the Saints to 4 points in the fourth quarter. "The lessons learned early in the season are paying off, and we hope to continue the trend of getting stronger as we go," said Coach Troy Baker. This week the Knights take on region front-runner Stone Mountain on Tuesday, Dec. 11, at 5:30 p.m. at Stone Mountain and face neighborhood rival Westminster on Friday, Dec. 14, at Westminster at 5:30 p.m. The varsity boys basketball team had two tough matchups this past week, both at home. On Tuesday, Dec. 4, the Knights hosted Buckhead rival Holy Innocents' and emerged with a 74-42 victory while playing stellar defense. Senior Myles Todd and junior Reign Watkins scored 20 points each, and sophomore Cole Middleton helped the effort with 17 points. 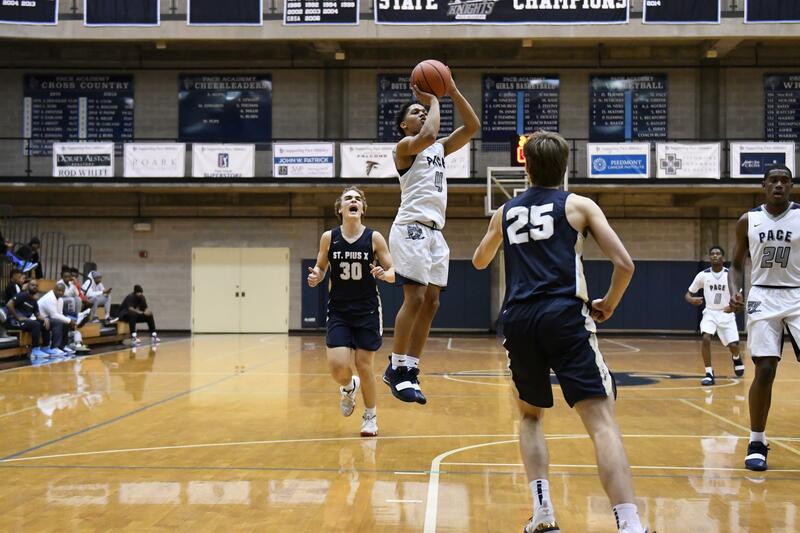 The Knights finished the game shooting over 50 percent from the field, capitalizing on Holy Innocents' turnovers and scoring 30 points on forced errors. On Friday, Dec. 7, the Knights lost a heartbreaker to last year's state runner-up, Cedar Grove. Cedar Grove scored with a 6-second buzzer beater to pull ahead 46-44. The Knights were again led by Todd, who scored 13 points, dished out four assists and snagged two steals. Sophomore Madison Durr contributed to the scoring effort with 9 points, and Watkins finished with a team-high five assists. The Knights have two region matchups this week. They face Stone Mountain on the road on Tuesday, Dec. 11, and finish out the week on Friday, Dec. 14, away against their Buckhead rival, the Westminster Wildcats.